The UK Government is broke, and is doing it’s best to spend as little money as possible, including on pensions. It’s offered state-employed doctors here a pension deal, but the doctors are not happy about it and now there’s talk of strike action. The situation may seem dire for patients who will not have as much access to medical care. However, if history is anything to go by, a doctors’ strike may in fact be a cause for celebration. 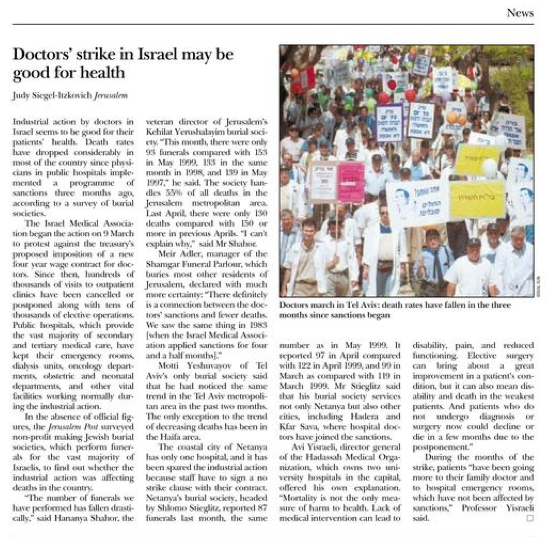 Industrial action by doctors in Israel seems to be good for their patients’ health. Death rates have dropped considerably in most of the country since physicians in public hospitals implemented a programme of sanctions three months ago, according to a survey of burial societies. The Israel Medical Association began the action on 9 March … Since then, hundreds of thousands of visits to outpatient clinics have been cancelled or postponed along with tens of thousands of elective operations. “The number of funerals we have performed has fallen drastically,” said Hananya Shahor, the veteran director of Jerusalem’s Kehilat Yerushalayim burial society. “This month, there were only 93 funerals compared with 153 in May 1999, 133 in the same month in 1998, and 139 in May 1997,” he said. Motti Yeshuvayov of Tel Aviv’s only burial society said that he had noticed the same trend in the Tel Aviv metropolitan area in the past two months. There are reports of similar drops in death rates when doctors have gone on strike in Canada and Los Angeles (though I’ve not been able to confirm the veracity of these reports) . I don’t want to denigrate the whole of conventional medicine. Actually, some aspects of it (high-tech diagnostics, surgery and emergency medicine, for example) I think are broadly genuinely worthwhile. However, a lot of what we do in medicine I think is not as effective as we’ve perhaps been led to believe. It can also be very hazardous (and take lives) of course. There’s a kinda cloak of respectability that still surrounds modern medicine. But the fact that death rates appear to fall when doctors go out on strike suggests that when we peel back that cloak, we find plenty of things we won’t like the look of. The truth is staring us in the face. Most health malfunctions are NOT cured. They are managed. This is in the interests of the pharmaceutical companies. Why would they research to find and promote drugs that ‘cure’ conditions’, which if managed, are not so life threatening. Hypertension for instance. There are always going to be ‘new sufferers’, presenting, but if there was a cure, or a preventative drug, which needed to be used just once, the drug manufacturers would be more than a little disappointed. If they can keep us alive, so we are reliant on repeat doses of their pills and potions, (which they sell to the NHS), then that’s what they will do. Or am I just being cynical? The local GP here has managed to lose a horrendous amount of her patients at a young age – I left her years ago in order to safe my life ! My visits to hospital have been horrendous torture; I’d be very happy for them to go on strike – as long as they don’t get any more pay or pension at the end of it ! The drop in burials could of course be connected to an absence of doctors to sign death certificates. That being so, deaths in hospital would be stored in hospital morgues. However there would be a concomitant increase in the number of corpses stored at funeral companies. Cheeky!! Perhaps patients avoided hospitals when they knew there were no staff to deal with them, hence a reduction in mortality? I urge people to be aware that half of their doctors (and nutritionists) are worse than average! Perhaps that is why hospitals are full of sick people. I avoid them whenever possible. John B – I’m not Jewish, but my understanding is that it’s highly unlikely bodies would be allowed to lie around in morgues for extended periods of time. Pierre – if people did avoid going to hospital, doesn’t that make the same point I’m alluding to in the post? Certainly with you on avoiding hospitals whenever possible! It’s difficult to tell what’s going on here unless you know what happened after the doctors returned to work. Suppose 1% of people die during operations. If these operations were suspended, then the death rate would fall for the duration of the strike. But if the operations were simply delayed, such that the doctors returned to work to face a backlog, then the death rate would rise in subsequent months, and we’d be back to square one. So, the strike just moves the deaths around; it doesn’t lead to any overall benefit to health. I call fallacy on this one. When “conventional medicine”* doctors strike you obviously reduce the mortality from complications and malpractice**, but you increase the risk long term risk mortality from disease complications. * A more honest comparison would have been between evidence based medicine and well “believe based” medicine, but that would have rendered your argument mute. 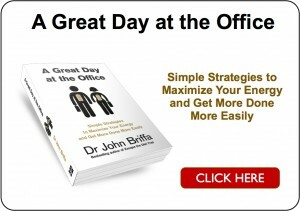 ** Complications and malpractice are not restricted to “conventional medicine” by the way. I was contemplating to say that “alternative medicine” does not increase the natural mortality from disease compared to non-treatment, but that is obviously not true as “alternative medicine” practitioners are prone to malpractice as well. And from what can this “obvious” non-truth be deducted? Namely, if there were any deaths arising from what you call “alternative medicine” and from what I call the only real medicine there is – because it has existed for many thousands of years which will never be the case with the conventional medicine (and is surely very much mainstream since even the US Army is using it now because they realized it is more effective, causes less side effects plus it costs them incomparably less than conventional medicine – it would be publicized 5000 times as much as any harm done by the conventional medicine paratcitioners. So why are we not reading/hearing about this all over the place??? Also, one should keep in mind that (at least in my country, I am not sure about the UK), conventional medicine practitioners, unless in private practice, are being paid automatically from the government Healthcare Fund, whether they do any work or not, and no matter how good their work is. If however I choose an alternative practitioner, I have to pay them out of pocket. So the situation is clearly not the same. As we all know, the motto of conventional doctors is “Primum, non nocere”, meaning “Firstly, do no harm (to the patient”). At least, this is what they claim. They have lost any rights to practice once they started using synthetic medicines because these all come with side effects, i.e., they are doing harm. They come with side effects because they meddle with the body in an unnatural way. It is not natural to isolate one enzyme, one pathway, one receptor etc. and act only on that, as if the rest of the body did not exist. So it is not natural – or normal – to use them at all, as it is not natural to do body some “good” with a particular drug but then also harm the body at the same time. (And there is no single drug that does not also harm.) This cannot be called healing or curing, and surely cannot be called “medicine” – this can only be called treatment of symptoms and since body is a whole you cannot pretend that harming one part of it will not harm the entity or the system as a whole. I am not saying there are no charlatans or quacks (or incompetent people) among the practitioners of alternative medicine. There are dishonest people everywhere (even among conventional doctors, I should say) and this is no typical for or even restricted to alternative medicine practitioners. What I am saying is that because alternative medicine works WITH the body and not AGAINST it, there is inherently less possibility to do harm. And when they do good they do it without side effects. Which is never the case with drugs – drugs always do some harm even if you do not see it. Let us be honest: conventional doctors who only treat by prescribing medicines are like well trained monkeys. They are taught: when the patient has the disease A, you have to prescribe them the medicine X. The lists of both diseases and medicines that they have to learn are impressively long, but at the end of the day, this is what they do. It is a sham that this should be called medicine at all. While I’m here, a quick comment about yoghurt. 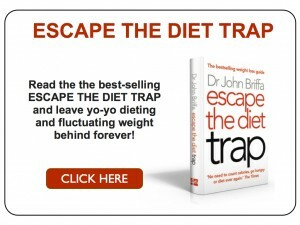 In ‘Waist Disposal’, and elsewhere, Dr Briffa recommends full-fat Greek yoghurt of the strained variety. So I went off to the local Waitrose and found that only one yoghurt fitted the bill, made by Total. when I started to buy it, this yoghurt came in three varieties: 0% fat, 3% fat, and one with no indication of the fat content except in the small print, where the fat content was listed as 10 gm per 100 gm, i.e. 10%. So far so good. But, shortly before Christmas, while checking the small print again, I noticed that the fat content had gone down to 5%. No other indication of the change, just the small print. So I wrote and asked why they had done this. No explanation, of course. Just regrets that I was disappointed, and an assurance that most reaction had been positive. Moral: Food companies are sneaky buggers. Always read the small print.